No matter what stage you are at in your project, we aim to make the process of selecting and procuring stone as straight forward as possible for both specifiers, including architects and designers, and their clients. It is important to us that you walk away knowing you can trust us to help provide the sophistication and elegance that you aim to achieve for your clients. If you have any projects coming up please feel free to get in touch. We have almost 30 years of experience in the industry, with decades of accumulated knowledge to match. The collective knowledge of our team is derived from a passion for the industry and hard work to continually improve. Whether it is bringing in new stone for special order, meeting with you and your clients, providing images and samples, giving insight into the use of materials, meeting tight deadlines to enable you to stay ahead of schedule or getting a delivery out, our team is dedicated and enthusiastic. We know everyone has a different taste and style when it comes to design. 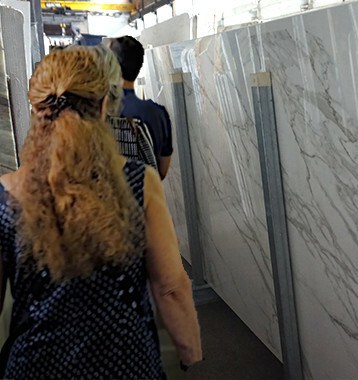 We supply over 400 unique materials and encourage you to view slabs in person, at our warehouse. You will work with one of our stone experts from first point of contact, through to completion. We tailor our service to you, in order to meet and exceed expectations. We invite designers and architects to bring their own clients to view materials at our warehouse. This enables them to hand pick and reserve materials themselves and keeps them involved with their project. We issue an open invitation to visit with your client. Even with the most difficult of selections, once a choice of stone surfaces is viewed in person a decision is much more easily made. We will also support you in finding a trustworthy and reliable route to project completion: If you need help finding a stonemason in your area, we are happy to refer you to one. At MGLW we try to bring you the best range of natural stone, along with the best engineered alternatives. We know the most creative outcomes arise from the most inspired minds. Here, we aim to put in front of you an unbeatable combination of surfaces, to help you gain that inspiration. ~ Carlos Silver, M&S Restorations Ltd.
– Largest stock in central London. – 25,000sq ft warehouse, fully enclosed to protect our materials. – Huge collective knowledge of stone. – Extensive network across the industry, including quarries, masons and other suppliers means we can assist in every aspect of your project. – Always innovating, bringing brand new materials to the UK market. – Samples and images provided where possible to give you clarity from start to finish.